Developed by engineering graduate Alec Momont, it can fly at speeds of up to 100 kilometres per hour (60 miles per hour). 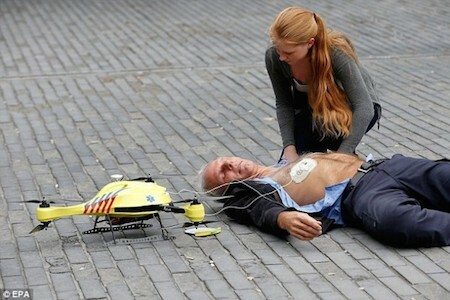 Painted in emergency services yellow and driven by six propellers, the drone can carry a four kilogramme load – in this case a defibrillator. "Man Forrester!" cried the joymaker from his belt. "I must inform you that Heinzlichen Jura de Syrtis Major has waived protest of the bonding regulations. The death-reversal equipment is on its way..."
The joymaker was addressing him again, bat he could catch only part of it. ". . . On station now, Man Forrester." A shadow passed over him, and he looked up. Overhead a white aircraft of some sort—it had no wings—was sliding diagonally down toward him. It bore a glittering ruby insigne like the serpent staff of Aesculapius on its side.